In our research, we focus on the development of polypept(o)ides – a hybrid material based on polypeptides and polypeptoids, e.g., polysarcosine. Our aim is to meet the complex requirements of therapeutic materials with robust and clean chemistry to develop not only potent therapies, but enable clinical translation. The reduction of synthetic efforts requires rethinking of existing concepts and developing new ones. With this in mind, we have developed protective groups for cysteines, which are stable against hard nucleophiles (ring-opening polymerization or solid phase synthesis), but reactive against soft ones (controlled disulfide formation), enabling post-polymerization of peptides by chemoselective disulfide formation. By applying these tools, we design nanoscopic or macroscopic materials based on polypept(o)ides either by chemical synthesis or by controlled self-assembly. While we perform monomer, polymer and particle synthesis and characterization in-house (collaboration with Manfred Schmidt), we work in close cooperation with biologists, pharmacists and medical doctors to understand the biological behavior and to adjust our carrier systems to the biology of medical needs. 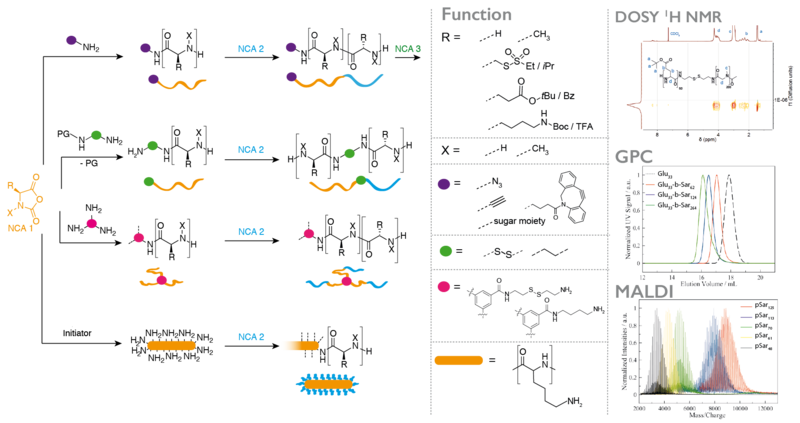 The first step in the development of multifunctional polypeptides is the synthesis of functional or reactive amino acids. Multifunctional polymers are often impossible to synthesize from a mixture of functional monomers due to problems in solubility, chemical group interferance with the polymerization itself, or simply due to differences in reactivity. On the other hand, standard solid phase (Fmoc cleavage) or NCA synthesis (acidic conditions) and polymerization (nucleophilic ring-opening polymerization by primary or secondary amines) expose functional groups to harsh reaction conditions. Thus, functional moieties are commonly protected (acids, thiols, alcohols and amines) and directly accessible reactive groups are limited, e.g. azides, alkynes or alkenes. Although these functionalities can be selectively addressed, they lead to C-C bond formation at the conjugation site, which are very unlikely to respond or to be cleaved in a biological environment. Therefore, we have developed a novel sulfonyl-based class of protective groups for cysteine and homocysteine, which are stable during peptide synthesis, NCA formation and polymerization but can be directly converted into disulfides. Disulfides are particularly interesting for biomedical appliactions since they are known to be stable in blood circulation, but are cleaved inside cells. The S-alkylsulfonyl groups (WO Patent 2015,169,908) are stable against primary and secondary amines, while they remain highly reactive towards thiols, yielding asymmetric disulfides in a quantitative manner within minutes at room temperature. Since the reaction of thiols with certain thiosulfonates proceeds in a highly selective manner and amines, alkenes or hydroxyl groups do not interfere, we can use this chemistry for site-selective conjugation of proteins or complex drugs in organic solvents or aqueous solutions. The application of polypeptides as biomaterials does often not require absolute sequence control, while a scalable synthesis and the incorporation of non-natural amino acids, e.g., N-substituted or reactive ones, is desirable. The ring-opening polymerization (ROP) of α-amino acid N-carboxyanhydrides (NCA) is therefore a versatile synthetic pathway to well-defined homo- and/or (block) copolypeptidic architectures. Whenever the polymerization itself is performed under controlled conditions, narrow molecular weight distributions, high end group integrities and low dispersity indices can be obtained. The NCA polymerization itself is not limited to natural amino acids, but versatile and scalable from milligrams to grams or even kilograms. In most cases, we use polysarcosine (poly((N-methyl)glycine)) as a non-ionic, non-immunogenic and hydrophilic polymer in combination with α-amino acids since they can both be easily transformed into the corresponding NCA by the Fuchs-Farthing method and can be polymerized under living conditions, leading to polymers with high end group integrity and dispersities below 1.1. In addition, the valence of initiators enables us to control the amount and position of functional groups within the polymer, control polymer branching and finally even adjust material properties by bottom up-synthesis. The most straightforward way to control nanoparticle properties such as size, shape, and internal structure is the synthesis of star-like or brush-like polymers. Oligovalent or multivalent initiators can be used to initiate the ROP, yielding spherical structures for small to medium sized initiators (cores containing 3, 6 or 12 amine functionalities) or worm-like for polymeric initiators (multivalent cores). The properties of nanostructures can be adjusted to the desired needs by controlling the block sequence and block length. After full conversion of the polymer block forming the hydrophilic corona (usually polysarcosine), the secondary amine end groups can be directly quenched with anhydrides or activated esters, introducing terminal functionalities. These functionalities can engage in post-polymerization modification reactions to attach bioactive moieties. In addition, the peptide blocks in the core of the system can be modified as well, which enables the synthesis of functional core-shell structures. The most common way in the bottom-up synthesis of core-shell polymeric nanostructures is self-assembly. The control of this process is one of the major scientific challenges in our century since it opens up a versatile pathway to nanomaterials with enormous possibilities. While we employ electrostatic interactions for the formation of polyplexes by complexing pDNA or mRNA with a cationic block of a block copolypept(o)ide, we use hydrophobic interactions as driving force for the self-assembly of amphiphilic block copolypet(o)ides. These block copolypept(o)ides undergo spontaneous self-organization in aqueous solution (block-selective solvent) and can be used as polymeric surfactants to stabilize hydrophobic interfaces in aqueous media. We have successfully applied amphiphilic PSar-block-PGlu(OBzl) copolymers to emulsion polymerization, mini-emulsion techniques and in polymer-drug formulations. Micelles, however, are of dynamic nature and in equilibrium with their unimers. Therefore, they possess reduced stability and are thus prone to premature disintegration and immune responses in vivo due to their amphiphilic character. Thus, stabilization of such aggregates appears necessary for most in vitro and especially for in vivo applications. Consequently, we can take advantage of the developed reactive thiosulfonyl-modified cysteines and homocysteines, which are hydrophobic and induce the formation of micelles in polar solvents (MeOH or water). Moreover, these polypeptides are highly reactive towards soft nucleophiles, enabling core cross-linking by disulfide formation with di- or oligo-thiols. Disulfide cross-linking is particularly interesting for biomedical appliactions since disulfides are known to be stable in blood circulation but cleaved inside cells due to a difference in redox potential (GSH concentration). If the cross-linker of choice is hydrophobic, core cross-linked micelles result. On the other hand, the use of hydrophilic cross-linkers enables the synthesis of nanohydrogels. Based on this approach, we can use a given block copolypept(o)die and let it self-assemble in a block selective solvent into worm-like micelles (facilitated by β-sheet formation) or spherical micelles (suppressing of β-sheet formation by thiourea), multi-compartment micelles or vesicles and preserve the structure during cross-linking (see figure 6). This pathway enables the synthesis of nanoparticle libraries that differ in morphology and core functionality. Interestingly, all nanoparticles, can be synthesized to have a neutral ζ-potential independent of their core polarity. Therefore, one single block copolymer can be used to synthesize either worm-like or spherical nanoparticles, where core properties can be decoupled from corona properties. Besides secondary structure-controlled self-assembly, we are interested in polyplex formation between block ionomers and pDNA or mRNA. Block ionomers are block copolymers combining a cationic and a "stealth"-like block in a single double hydrophilic block copolymer. They can induce the formation of core-shell polyplexes, in which the cationic block complexes the nucleic acid, while the hydrophilic "stealth"-like block shields the assembly from undesired interactions with blood components and increases its stability towards disintegration. Furthermore, a third functionality is required to enhance transfection efficiency, which are endosomolytic groups, e.g. imidazole side chain of histidine, sequence-defined oligo(ethylene imine)s or viral peptides. These groups enable endosomal escape by membrane interactions or by the so-called proton sponge effect. Block ionomers for efficient transfection agents do not only require the combination of cationic/complexing, endosomolytic and "stealth"-like groups but also control over polymer microstructure. With a view towards a systemic application, polyplexes need to be stable in complex body fluids. Therefore, we incorporate the developed activated thiols (cysteine and homocysteine) as a middle block in the triblock copolymers. This novel type of block ionomer can complex nucleotides efficiently and allows for bioreversible stabilization by cross-linking using di- or oligo thiols after polyplex formation. We are currently screening synthetic and virus-derived endosomolytic cross-linkers leading to polyplexes, which are stable in serum, can be targeted to specific receptors and transfect the target cells more efficiently than jetPEI (poly(ethylene imine)-based transfection agent) or Fugene HD (lipid-based transfection agent). Besides stimulating dendritic cells, breaking immune tolerance by regulatory T-cells is a key requirement for potent immune response against tumor cells. Solid tumors have developed efficient mechanisms to down-regulate the immune system at the tumor side. Hence the stimulation of an APC-induced immune response does not necessarily lead to a T-cell attack against tumor cells. One of the molecules involved in the signaling pathway inducing immune suppression is the second messenger cAMP. In collaboration with the groups of Dr. C. Becker and Prof. T. Bopp (University Medical Center Mainz), we have developed block copolypept(o)ide-based formulations of an adenylate cyclase inhibitor and were able to reduce intracellular cAMP levels effectively. After peritumoral administration, the delivery of the inhibitor reduces cAMP levels in Treg cells efficiently and leads to an abolishment of Treg-related immune tolerance, which reduces tumor growth and elongates the average time of survival of mice. Moreover, the treatment of many diseases related to bacterial infections is still an unmet medical need. Various bacteria, for example in our lungs, remain difficult to treat. One problem is the combination of mucus in the lung with the biofilm generated by the bacteria, which hinders antibiotics to reach the pathogen. In collaboration with Prof. Gareth Griffith (University of Oslo, Norway), we use our PeptoMicelles and PeptoColloids with neutral ζ-potential and hydrodynamic diameters between 40 to 400 nm for controlled drug delivery to bacteria in the respiratory system. Transcriptional targeting combines the tumor antigen with the immune activator on pDNA or mRNA level. In collaboration with Prof. Sahin and BioNTech AG, we are developing mRNA vaccines based on our cross-linked PeptoPlexes. The lead candidates outperform even jetPEI in terms of protein expression in human dendritic cells in vitro, while being stable in serum without any detectable aggregation (DLS in human plasma, Prof. M. Schmidt) or degradation. In vivo studies are currently ongoing. 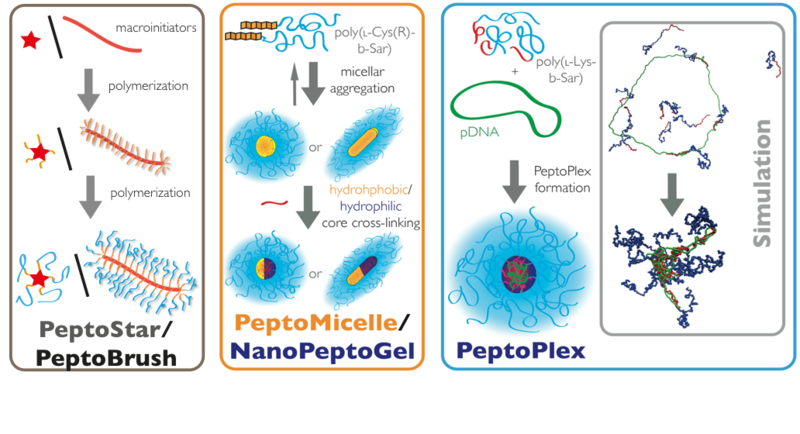 Beside mRNA vaccines, we also use the PeptoPlex technology for the development of pDNA vaccines. The DNA-based approach enables the use of a promoter (fascin promotor) that is highly specific for dendritic cells. Since the delivered pDNA cannot be processed in other cells, off-target effects can be effectively reduced. We are confident to achieve a potent DC-induced stimulation of the immune system, while at the same time, effectively avoiding effects, which would lead to immune suppression. In the ongoing research project with the group of Dr. M. Bros and Prof. A. Reske-Kunz, we were already able to design PeptoPlexes, containing viral peptides for the transfection of DC2.4 cells (DC model cell line) and murine dendritic cells in vitro. These cross-linked polyplexes are also stable in human and murine serum and protect the pDNA from degradation. The two most potent polyplexes are currently investigated in B16 mice as first systemic pDNA vaccines for a tumor immune therapy against cancer. In collaboration with the groups of Prof. K. Kataoka (University of Tokyo, Japan), Prof. Ernst Wagner (LMU, Munich, Germany) and within the SFB 1066 (University Medical Center, Johannes Gutenberg University Mainz), we are developing siRNA-based cancer therapies. Within the scope of these projects, the target-specific siRNA is loaded into our NanoPeptoGels or PeptoPlexes and is hence protected during systemic circulation. The carriers are core cross-linked, combining activated thiol-based disulfide formation with sequence-defined cross-linkers based on oligo-aminoethene fragments. While disulfide bonds are cleaved after endocytosis, endosomolytic molecules are released and enable endosomal penetration into the cytosol (endosomal escape). Afterwards, NanoPeptoGels or PeptoPlexes release the siRNA into the cytosol, where it can fulfill its task of degrading the encoded mRNA. This leads to a reduction of disease-related protein expression (therapy of cancer, liver fibrosis or immune modulation). The immune system has evolved to recognize and respond to pathogens, which are usually in the size of nanometers (viruses) to micrometers (bacteria). Therefore, nanoparticles seem to be ideal systems to direct immune responses against disease-associated antigens or reprogram our immune system to avoid autoimmune responses (chronic inflammation or allergies). Within the SFB1066 and in close collaboration with Prof. Manfred Schmidt, we have developed bottle brush polymers based on polypept(o)ides, which combine antigens, immune activators and targeting moieties (aDEC205 antibodies) on a so called PeptoBrush. These nano-sized vaccines induce an antigen-specific T-cell proliferation (OT1 and OT2 response) in vitro (murine bone marrow derived dendritic cells and T-cell) and in vivo (murine B16 melanoma model) after local administration. Currently, PeptoBrush-based vaccines are evaluated for systemic vaccination. The modular synthesis eases the incorporation of various antigens, immune activators and antibodies and thus, enable develop vaccine libraries. 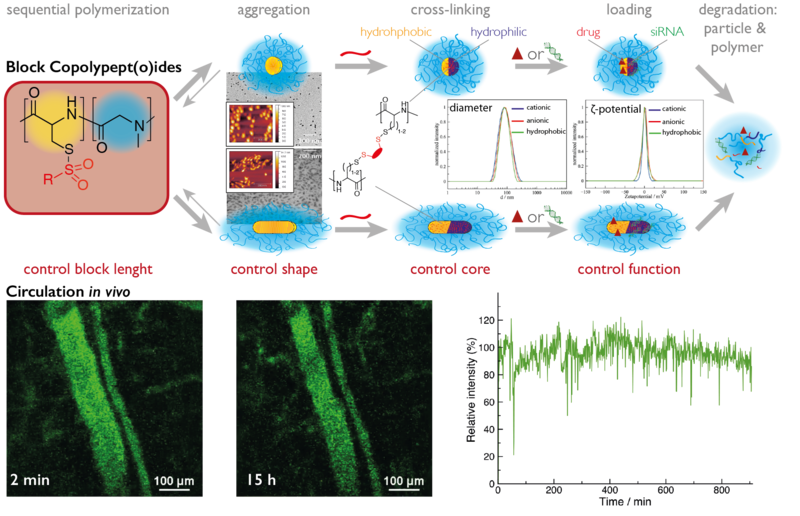 In collaboration with the group of Prof. F. Kiessling (ExMI, RWTH Aachen), we functionalize our core cross-linked micelles (PeptoMicelles) and star-like block copolypept(o)ides (PetoStars with riboflavin and NIR dyes for semi-quantitative optical reflectance imaging). Riboflavin can be used as an universal targeting ligand since it binds with high affinity to cancer (stem) cells and endothelial cells of the tumor (neo)vasculature. The size of the carrier dictates if the particle binds to endothelial cells (large particles, release of vascular disruptive drugs) or penetrates into the tumor and to get take up by tumor cells (small particles, release of cytostatic drugs). Together with Prof. A. Kjear, Prof. J. Kristensen and Prof. M. Herth at the University of Copenhagen, we are developing a polymer-based pre-targeting approach, which can enable new perspectives in tumor imaging by positron emission tomography (PET) and radiation therapy. Bioorthogonal chemical reactions between two exogeneous moieties without interfering with native biochemical processes in vivo enable a pre-targeting approach in combination with short-lived radionuclides (β+- (PET imaging) or α/γ- (radio therapy) emitters). Thus, routinely used short-lived isotopes in clinical settings, such as fluorine-18 or carbon-11, become accessible for long time in vivo imaging of the biodistribution (tumor accumulation) of nanoparticles. For the pre-targeting approach, a nanoparticle with multiple reactive moieties (in our case, trans-cyclooctenes) is injected first. At certain time points, a short-lived radionuclide-labeled tetrazine is administered to react in vivo specifically with the trans-cyclooctene on the polymeric nanoparticle. This approach enables repeatable PET imaging, leading to snapshots at multiple time points, which in combination can provide information about long-term biodistribution without applying long-lived radionuclides. Functional end groups in polypeptides, polypeptoids and polypept(o)ids are accessible in a straightforward manner using either functional initiators (α-chain ends) or post-polymerization modification reactions (ω-chain end). Both approaches allow for the introduction of a variety of different end groups, yielding either homotelechelic or heterotelechelic polymers. By using ethylene diamine or functional derivatives thereof as initiators in the polymerization of SarNCA, polysarcosine with diamine end groups result that can be further modified by post-polymerization modification with reactive moieties, such as maleimide groups. In this way, bifunctional macromolecular cross-linkers are synthesized that can be employed for the cross-linking of hyaluronic acid-based hydrogels for 3D cell cultures. Furthermore, copolypep(o)ides have been used for the synthesis of polymer fibers by electro-spinning from solution. The formed fibers are highly biocompatible and are currently under investigation as scaffolds for tissue engineering. Amphiphiles and, in particular, PEGylated lipids or alkyl ethers represent an important class of non-ionic surfactants and have become key ingredients for long-circulating (“stealth”) liposomes. While poly-(ethylene glycol) (PEG) can be considered the gold standard for stealth-like materials, it is known to be neither a bio-based nor biodegradable material. In contrast to PEG, polysarcosine (PSar) is based on the endogenous amino acid sarcosine (N-methylated glycine), but has also demonstrated stealth-like properties in vitro, as well as in vivo. In this respect, we report on the synthesis and characterization of polysarcosine based lipids with C14 and C18 hydrocarbon chains and their end group functionalization. Size exclusion chromatography (SEC) and matrix-assisted laser desorption/ionization time-of-flight mass spectrometry (MALDI-TOF MS) analysis reveals that lipopeptoids with a degree of polymerization between 10 and 100, dispersity indices around 1.1, and the absence of detectable side products are directly accessible by nucleophilic ring opening polymerization (ROP). The values for the critical micelle concentration for these lipopolymers are between 27 and 1181 mg/L for the ones with C18 hydrocarbon chain or even higher for the C14 counterparts. The lipopolypeptoid based micelles have hydrodynamic diameters between 10 and 25 nm, in which the size scales with the length of the PSar block. In addition, C18PSar50 can be incorporated in 1,2-distearoyl-sn-glycero-3-phosphocholine (DSPC) monolayers up to a polymer content of 3%. Cyclic compression and expansion of the monolayer showed no significant loss of polymer, indicating a stable monolayer. Therefore, lipopolypeptoids can not only be synthesized under living conditions, but my also provide a platform to substitute PEG-based lipopolymers as excipients and/or in lipid formulations. The project aims to control morphology and function of brush-like peptidic carriers, which are either derived from living polymerization or result from (further processed) natural monodisperse peptides. In addition, peptide based targeting units are modified to allow selective ligation. In combination, this project aims at the preparation of systems to study, how morphology (rod or sphere like structures) and/or the ligation of antibodies modifies the interaction of the carriers with immune cells. The project aims at the elimination of the immune-tolerance in melanoma by modulating the cAMP concentration locally. This will be done with micellar formulations of adenylatcyclase-, protein kinase A- or casein kinase inhibitors, which have –in parts– already shown to work successfully in mouse models. For this purpose, the delivery system will be improved with regard to targeting and local release to enable the therapeutic use of this concept. Within this project nano-particular mRNA carriers, which are able to reach different immune-cell populations in different parts of the body and to reprogram them, are developed. This will be done in a preclinical setting with the aim to establish new mRNA based therapies. As carrier systems both lipo- and polyplexes will be studied, which allow an optimization via high-throughput-screening. Companion diagnostics are crucial for drug development and disease management with regard to patient selection, therapy planning and monitoring. Nanomedicines such as antibodies have been proven to be optimal disease-targeting agents because they generally exhibit superior target uptake and retention. However, to date, nuclear imaging of nanomedicines has been limited to the use of long-lived isotopes to be compatible with the slow pharmacokinetics of these large molecules. Major drawbacks are high radiation doses, precluding routine and repeated companion imaging procedures. The Click-It consortium aims to circumvent this issue by using pretargeting approach, which centers on the administration and target binding of a tagged nanomedicine followed by administration and binding of a small, fast-clearing, short-lived radiolabeled probe to the tag of the nanomedicine. This results in lower absorbed radiation doses and in a boost in target-blood ratios, which in turn leads to a superior imaging contrast. PET scan snapshots at multiple time-points provide long-term imaging information by applying short-lived nuclides. So far, only the fastest click reaction, the tetrazine ligation, has demonstrated potential in clinically relevant conditions. Recently, we have shown in a SPECT imaging study that this click reaction can be applied for non-internalizing nanomedicines in vivo. 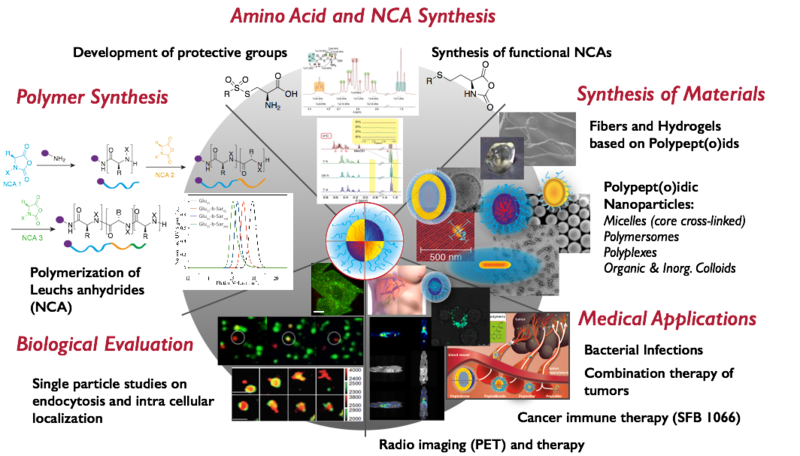 This project aims at expanding the scope of click-pretargeted imaging to intracellular targets, because a majority of nanomedicines internalize and is thus not accessible with the current approach. Furthermore, we will expand our approach to short-lived, non-metal based, small molecule 18F-PET tracers, since PET offers a higher spatial and temporal resolution enabling quantitative decision making in disease diagnosis and management. Finally, the project aims to translate the developed click-pretargeting technology into a clinically applicable nanomedicine-based imaging approach in canine patients.